This week’s take-away was a simple and delicious meal. Some of the components are similar to recipes I’ve posted before, but I’ll put them here just in case. The main course was “Not-chicken” salad. The chicken-y (chicken-ish?) part is a sunflower seed-based pate, mixed with some additional veggies. I served it on a bed of chopped spinach, with lots of vegetables (sprouts, tomatoes, shredded carrot, radish and cucumber) and a red pepper dressing. It was very tasty, if I may say so myself. 1. Make the sunflower seed paté. Stir in chopped celery and spring onions. Set aside. 2. Start with chopped spinach. Top with the other vegetables. 3. Put a scoop of sunflower seed pate in the middle, and drizzle red pepper dressing over the vegetables. Enjoy! Blend all ingredients in food processor until well-mixed, though still slightly chunky. For dessert, Ani Phyo’s lemon bars. 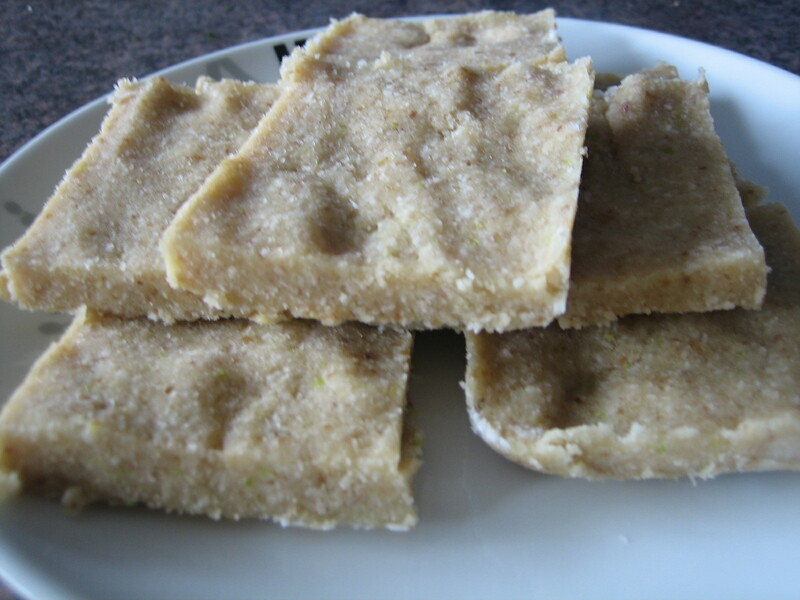 I’ve recommended the Ani Phyo cookbook where I found the recipe on the resources page. 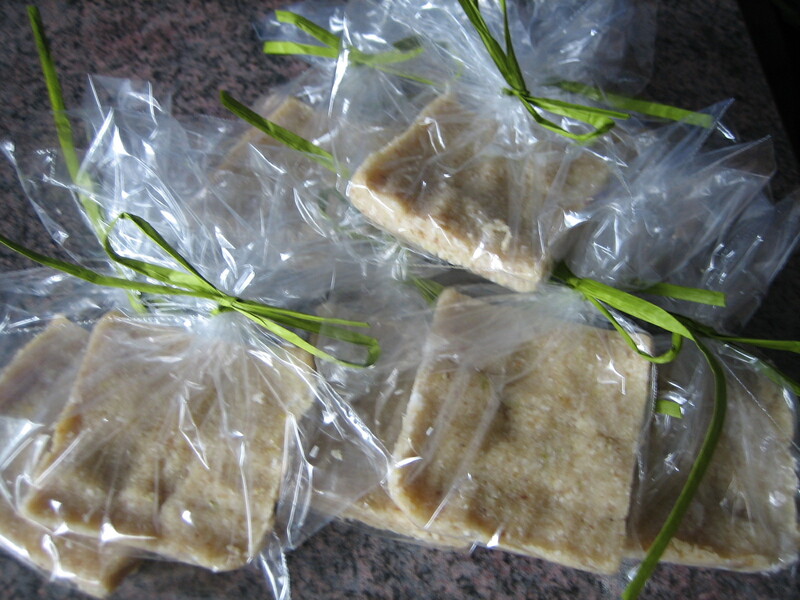 Here’s a link to somebody else’s page where the lemon bar recipe has been slightly modified. This is pretty much how I did it too. But given that it only makes a 9×9 inch square pan, I’d say it’s 9 servings, not 12. The bars are too tasty to cut into such small pieces. Next week there will be no raw Tuesday take-away, but we’ll be back the week after that (9th of March). Stay tuned! 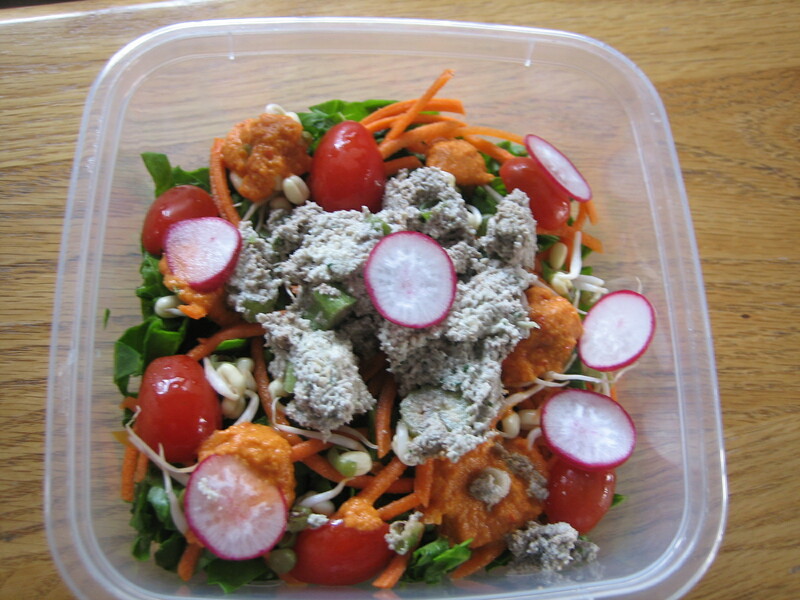 This entry was posted in desserts, Raw Food, recipes, salads, Uncategorized and tagged raw chicken salad, raw lemon coconut bars, raw recipes, Vegan. Bookmark the permalink.